The Crab Nebula is a supernova remnant and pulsar wind nebula in the constellation of Taurus. Corresponding to a bright supernova recorded by Chinese astronomers in 1054, the nebula was observed later by John Bevis in 1731. At an apparent magnitude of 8.4, comparable to that of the largest moon of Saturn, it is not visible to the naked eye but can be made out using binoculars under favourable conditions. At X-ray and gamma-ray energies above 30 keV, the Crab is generally the strongest persistent source in the sky, with measured flux extending to above 10 TeV. Located at a distance of about 6,500 light-years (2 kpc) from Earth, the nebula has a diameter of 11 light years (3.4 pc, corresponding to an apparent diameter of some 7 arc minutes) and expands at a rate of about 1,500 kilometers per second (0.5% c). It is part of the Perseus Arm of the Milky Way Galaxy. At the center of the nebula lies the Crab Pulsar, aneutron star 28–30 km across, which emits pulses of radiation from gammarays to radio waves with a spin rate of 30.2 times per second. The nebula was the first astronomical object identified with a historical supernova explosion. The nebula acts as a source of radiation for studying celestial bodies that occult it. In the 1950s and 1960s, the Sun’s coronawas mapped from observations of the Crab’s radio waves passing through it, and in 2003, the thickness of the atmosphere of Saturn’s moon Titan was measured as it blocked out X-rays from the nebula. A thousand years ago, a brilliant beacon of light blazed in the sky, shining brightly enough to be seen even in daytime for almost a month. Native American and Chinese observers recorded the eye-catching event. We now know that they witnessed an exploding star, which left behind a gaseous remnant known as the Crab Nebula. The same object that dazzled skygazers in 1054 continues to dazzle astronomers today by pumping out radiation at higher energies than anyone expected. Researchers have detected pulses of gamma rays with energies exceeding 100 billion electron volts (100 GeV) —a million times more energetic than medical X-rays and 100 billion times more than visible light. “If you asked theorists a year ago whether we would see gamma-ray pulses this energetic, almost all of them would have said, ‘No.’ There’s just no theory that can account for what we’ve found,” said Martin Schroedter of the Harvard-Smithsonian Center for Astrophysics (CfA) in Cambridge, Massachusetts. 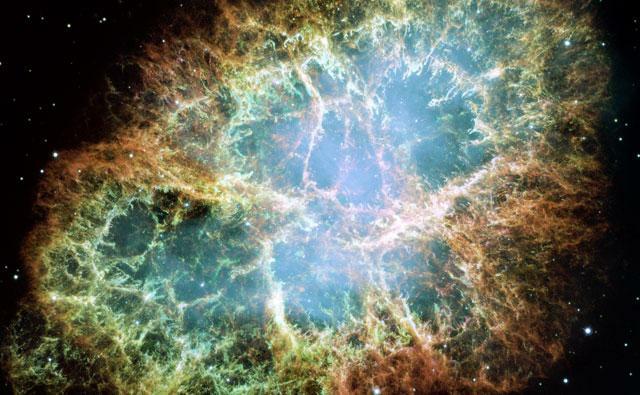 The gamma rays come from an extreme object at the Crab Nebula’s center known as a pulsar. A pulsar is a spinning neutron star — the collapsed core of a massive star. Although only a few miles across, a neutron star is so dense that it weighs more than the Sun. Rotating about 30 times a second, the Crab pulsar generates beams of radiation from its spinning magnetic field. The beams sweep around like a lighthouse beacon because they’re not aligned with the star’s rotation axis. So although the beams are steady, they’re detected on Earth as rapid pulses of radiation. An international team of scientists reported the discovery. Nepomuk Otte from the University of California, Santa Cruz, said that some researchers had told him he was crazy to even look for pulsar emission in this energy realm. Some possible scenarios to explain the data have been put forward, but it will take more data, or even a next-generation observatory, to really understand the mechanisms behind these gamma-ray pulses. The Very Energetic Radiation Imaging Telescope Array System (VERITAS) — the most powerful high-energy gamma-ray observatory in the Northern Hemisphere —detected the gamma-ray pulses. VERITAS is located at the Smithsonian’s Whipple Observatory, just south of Tucson, Arizona. Astronomers observe very-high-energy gamma rays with ground-based Cherenkov telescopes. These gamma rays, coming from cosmic “particle accelerators,” are absorbed in Earth’s atmosphere, where they create a short-lived shower of subatomic particles. The Cherenkov telescopes detect the faint, extremely short flashes of blue light that these particles emit (named Cherenkov light) using extremely sensitive cameras. The images can be used to infer the arrival direction and initial energy of the gamma rays. This technique is used by gamma-ray observatories throughout the world, and was pioneered under the direction of CfA’s Trevor Weekes using the 10-meter Cherenkov telescope at Whipple Observatory. The Whipple 10-meter telescope was used to detect the first galactic and extragalactic sources of very-high-energy gamma rays.